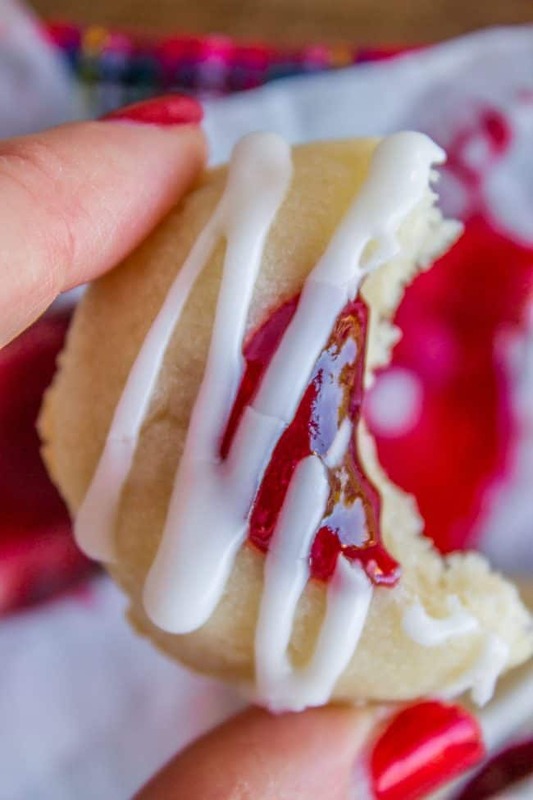 These Raspberry Almond Shortbread Thumbprint Cookies are one of my favorite Christmas cookies! They are so easy to make and look very impressive on a cookie plate. All you need is a lot of butter and some raspberry jam. They are a Christmas classic! The amount of cookies in my house right now is RIDICULOUS. There are probably like, 20? Maybe? Not even? 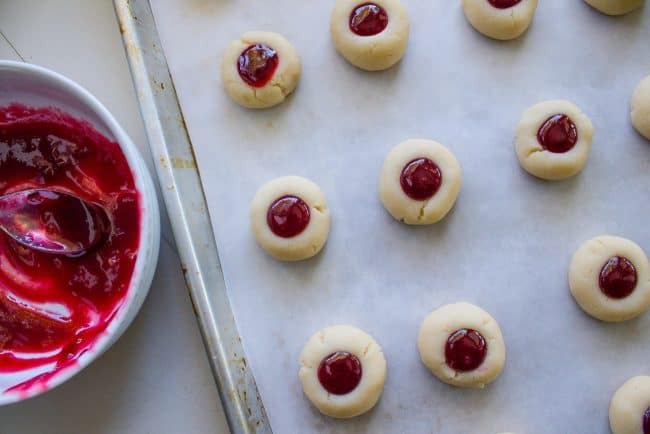 This is a disturbingly small amount, because I have literally made these Raspberry Almond Thumbprint cookies at least 4 times in the past few days, testing for this post. 35ish cookies per batch = 140 cookies at least. WHERE ARE THEY YOU GUYS? Where?? Anyway, I looked around for that tupperware full of cookies and didn’t see it on the counter. Huh. Maybe Eric took it to work? (The whole thing??) I settled for a couple whoppers from the pantry for breakfast dessert and went on with my day. Eric gets home from work tonight, and I’m like, dude, where are all the cookies? Did you take them to work? He just smiles at me knowingly and tells me that he hid them. HE HID THEM. Okay okay, sorry to all the people in the world with real addictions, I’m sure I’ve offended you all. But really, it’s a good thing I’ve got Eric around to keep me in line. Although the joke’s on him. I made a batch of fresh cookies (these ones!) instead of searching for the hidden ones. Problem solved. 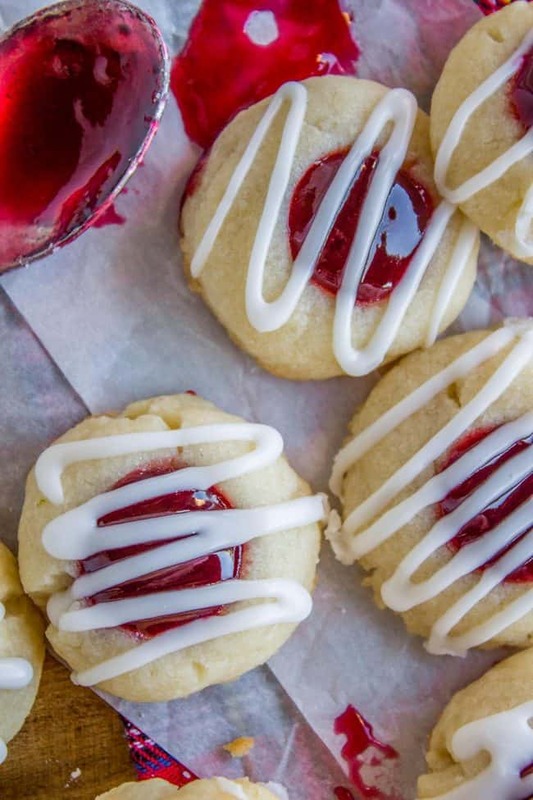 Everybody and their mom makes these Raspberry Thumbprint cookies, right? I’m sure you’ve had them before. The recipe has been around forever. I feel like everyone I’ve offered these to this week has said, Oh, I LOVE these cookies, my sister/grandma/mom used to make them! 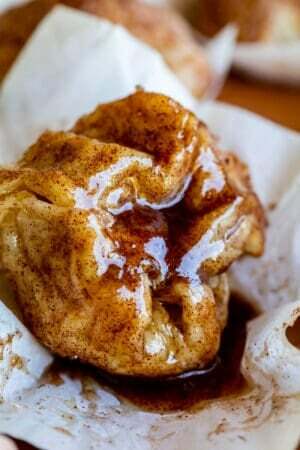 They are just a classic and everyone needs to try making them at least once. They are so pretty on a Christmas plate. Two years ago: 20 Minute Lemon Broccoli Pasta Skillet << one of the top recipes on my site! 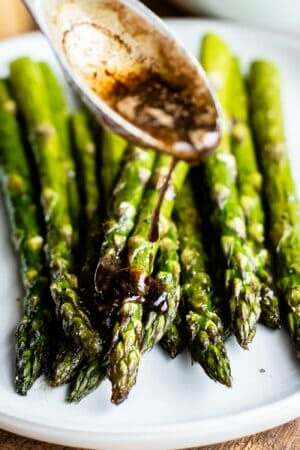 Add the almond extract and salt. Beat well. Add the flour. Beat until the mixture forms a stiff ball of dough. Once the dough has come together, stop beating, you don't want to end up with a tough dough. 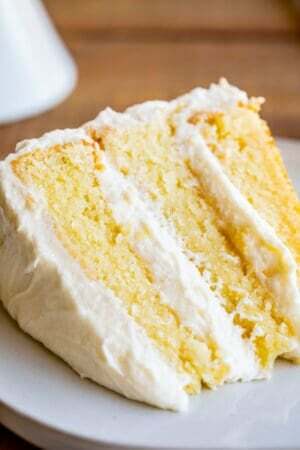 When you are ready to bake, take it out of the fridge and let it soften on the counter for 10-20 minutes. Line 2 baking sheets with parchment paper or a silicone baking mat. 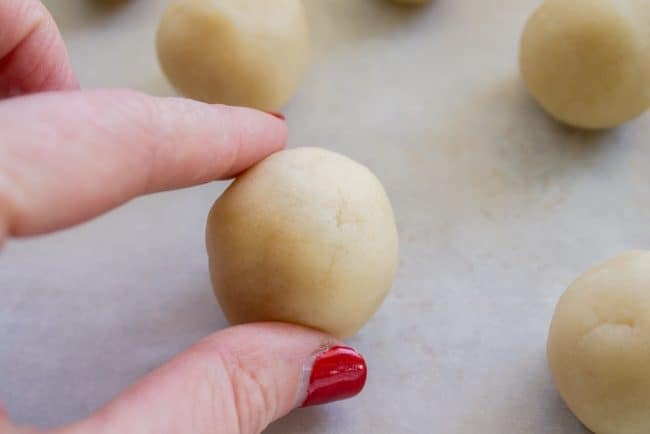 After the dough has softened a bit, preheat the oven to 350 degrees F.
When the dough is malleable but still cold, shape into balls that are about 1 tablespoon worth of dough. It's a little bigger than a 1-inch ball of dough. Place the dough on the baking mat. You can put them pretty close together, you only need about 1 inch of space between them. Use something to press the cookie down in the center. Thumbs are okay, but it's even better if you find something that's about the size of a tube of chapstick. (Clean your chapstick off and use it!) I used the handle of a wooden spoon that's about 3/4 inch across (thicker than most wooden spoon handles I think), and it was perfect. I've read about people using corks too. However you want to do it, make a well in the center of the cookie. You want to press about halfway down, don't press all the way through or your jam will seep through to the baking sheet. The edges of your cookie will likely crack. You can patch minor cracks with your finger, or if they are small enough leave them. If all of them are cracking pretty badly though, to the point that the jam would likely seep out, then let your dough get a little closer to room temperature by waiting another 10 minutes or so. If you shape them into balls and then wait a few minutes to press, they will warm up even faster. Scoop some jam into a bowl and stir it well to get out the lumps. Use a small spoon to fill each cookie. You are using a pretty tiny amount of jam. Don't go crazy. Think between 1/4 and 1/2 teaspoon. Fill it only until it reaches the top of the little well you have made. Don't let it drip out the sides or your cookie will get destroyed in the oven. See photos above for how I fix a little jam spillage. At this point I always take the time (and make room in my fridge) for a little chill. Just like 15 minutes will do. You can skip this step if you think your dough is still cold enough. Remember, cold dough going in the oven=nice and puffy cookies. Bake at 350 for about 12-14 minutes. Start with 12. You want to take them out JUST as the edges are starting to turn golden (around 14 minutes) or even before they start browning (By 12 minutes they are usually brown on the bottom but not on the edges). 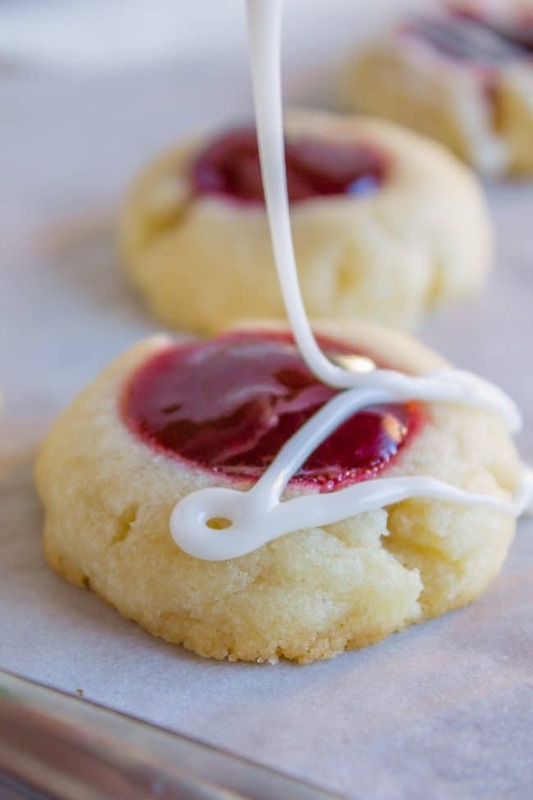 The cookies should not be shiny and the jam should be bubbling. Let the cookies set on the baking sheet for about 10 minutes, then remove to a wire rack to cool. In a small bowl, stir together the powdered sugar, 1 and 1/4 teaspoon almond extract, and 2 teaspoons milk. Add the extra teaspoon of milk if it seems too thick. (If you accidentally make it too thin, just add a teaspoon of powdered sugar). Drizzle the glaze over the cookies and then let cool completely. Try not to each 4 batches all in the same week. *The reason I tested these cookies so many times was because I was trying to cheat through this pesky 2-4 hour chill step. What a bother. I tried freezing the dough, I tried shaping the cookies right away and then refrigerating/freezing the pan for 30-45 minutes and then baking, but alas, all my tests failed. And by failed I mean you still get great cookies, they just bake a little too flat for my liking. If you want the perfect little button of a cookie, you MUST chill 2-4 hours. I think this recipe is from a Pillsbury cookbook that came out a long time ago, but I adapted the recipe from my friend Melanie, who got it from Allrecipes.com. 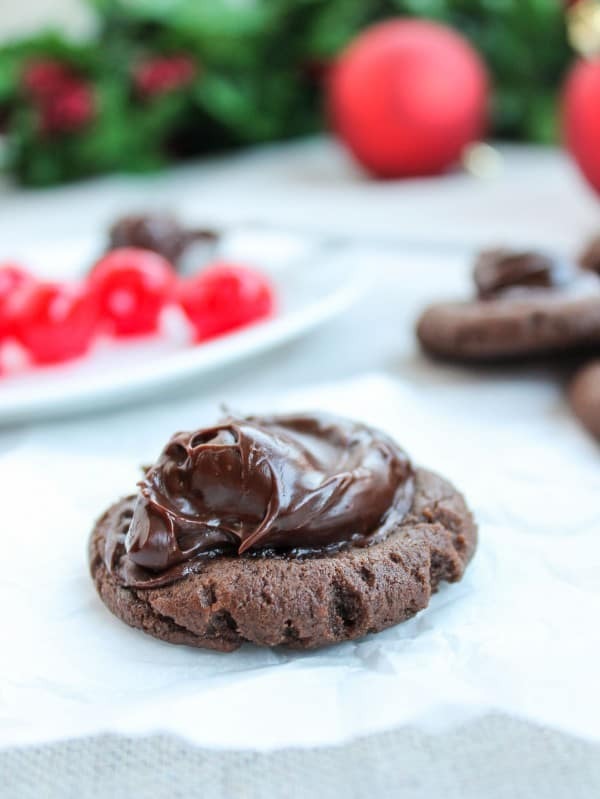 More holiday cookies you should make this year! 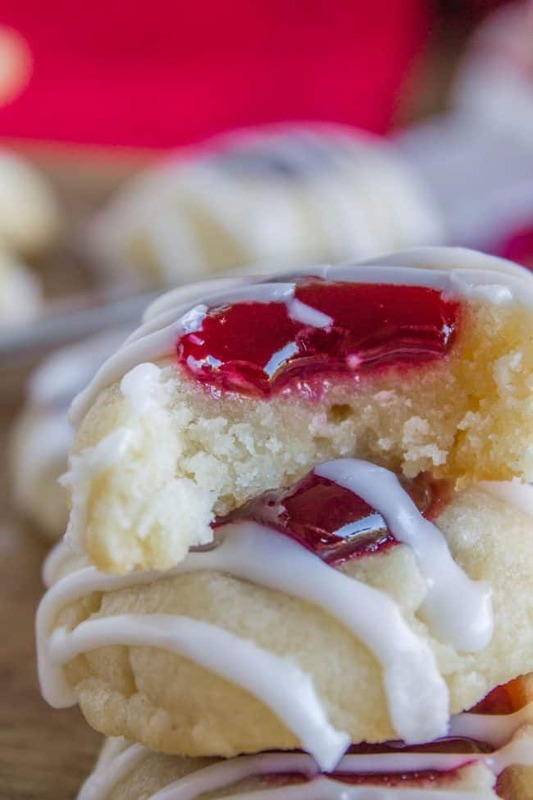 Buried Cherry Cookies << here’s another thumbprint cookie you HAVE to try! I’m making these later this week! Caramel Pecan Thumbprint Cookies << someday I will reshoot these cookies, but until then you are going to have to trust me that they are insanely good. 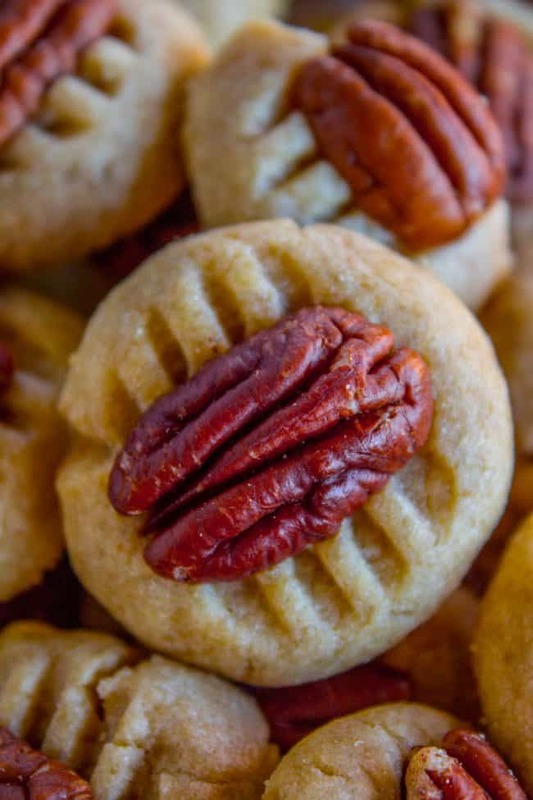 Butter Pecan Cookies << you might be tired of me talking about Butter Pecans lately. I’M NOT SORRY, THEY ARE THE BEST. 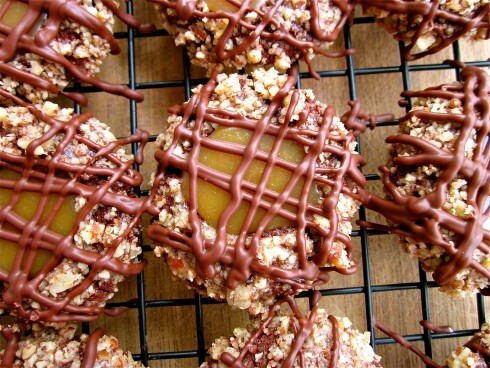 More cookies from blog friends that you will love! I made these cookies and all I can say is “WOW”. These are now everyone’s favorite. I made two batches before Christmas and two more after. 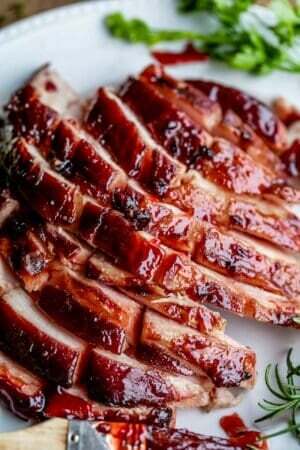 Thanks for this incredible recipe!!! Yay!! That is the best kind of recipe, when you’re happy making it 4 times in one month! Thanks for the feedback Theresa, I’m so glad you commented! So darned cute! I used the cap end of my food coloring to make the depression. I put them directly into the freezer when they had cooled so I wouldn’t eat them all. I don’t think they need the glaze at all, but it is pretty. 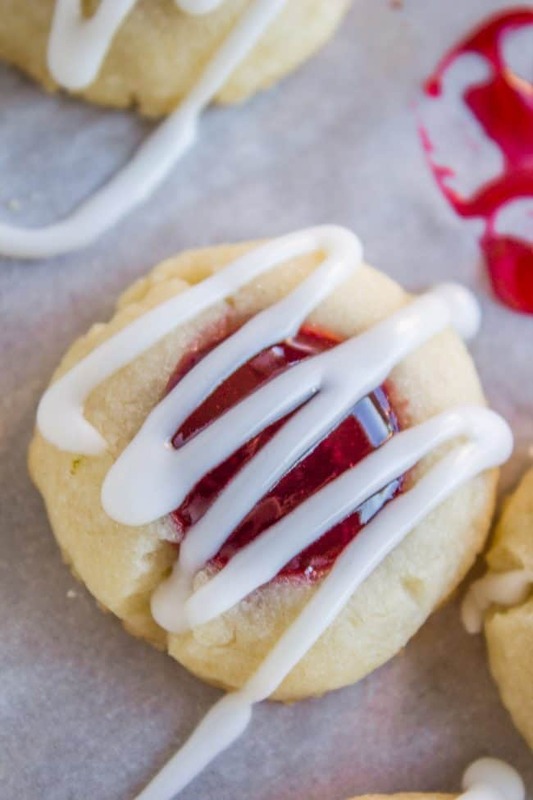 Could I fill with jam after the cookie is baked? Or is there a reason for filling beforebaking? Hey Dorothy! 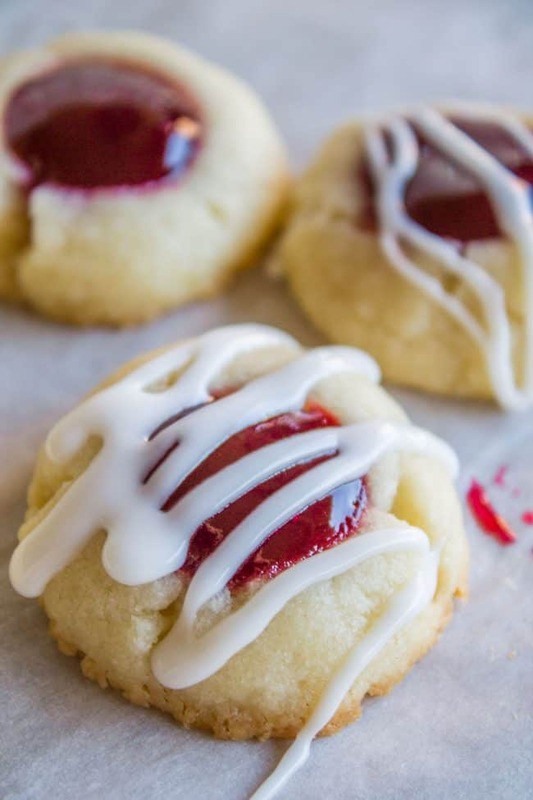 When you bake the jam it bakes into the cookies a little bit, then sets up after it cools. Baking does change the flavor a little bit. If you did it after it would be tough to transport them although still tasty! Do you freeze them when there cooled or do you put in Fridg till Christmas? Hey Maria! I usually eat them right away, eep!! ;) but if you wanted to save these for later I bet you could make them all the way through the glaze and then flash freeze them on a pan (Just put the pan in the freezer) then once they are frozen put them in a tupperware for long term freezing (long terms meaning like a week max.) You can also freeze the dough pre baking, just thaw before using. Hope this helps! F A B U L O U S ! ! ! 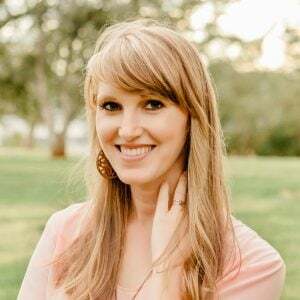 Love love love these and love your posts! Thank you!!! Now, if I may ask, which raspberry jam do you prefer? Figured I would ask THE EXPERT! Haha thank you so much Keely! I don’t know that I’m a jam expert but I personally love smuckers. I get the seedless red raspberry Jam. (not preserves). I hate seeds in my cookies no thank you! they get stuck in my teeth! just smooth jam for me please. But really ANY kind of jam or jelly will work in this recipe! I hope you make them and LOVE them!!! Thansk Keely! Unfortunately, I can relate! Cookie addicts unite! Hah! These cookies sure look so yummy and I will be making the little beauties for my Christmas Cookie Platter! Thanks for sharing the recipe, Karen! Right? We should have our own addicts meetings. :) :) I hope you love these ones Deb! Merry Christmas! !